Friday at Vancouver Fashion Week (VFW) held a real treat for me. 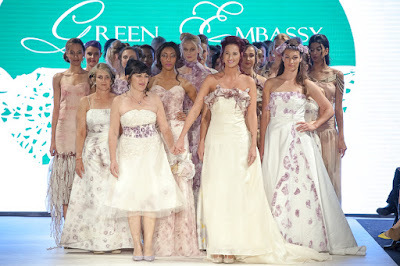 It was a show by my dear friend and couture designer, Zuhal Kuvan-Mills of Green Embassy. I still fondly remember her first show in March 2014. She showcased a beautiful collection of felted garments decorated with twisted dark wool filigre and accessories that used the scraps in honour of her Zero Waste policy. I was an instant fan. On her second visit in September 2014, we were able to find a few free hours where I could do an in-depth interview on her journey. The highlights? She was born in Turkey, has lived in England and is now a resident of Perth, Australia - a place she truly loves - where she lives on a farm and raises Alpacas and chickens. There have been several careers before fashion came into her life - Veterinarian, Educator and Textile Artist. Her entry into the fashion world came when she draped some of her textiles over models at a show. Someone assumed they were garments and invited her to do a runway show. My favourite story of all I think exemplifies who she is right down to the core, and she lives these principles each and every day. One day Zuhal read an article on a young girl in Turkey who was buried alive by her family for supposedly looking at a man. There were several other stories of similar nature that came to light around the same time. Her heart ached. As an artist, she decided to create a gallery piece in honour of the 50-60 Turkish women who lost their lives this way every year. First there was a large textile created. Then 50-60 red candles were made in the shape of Turkish coffee cups. They were placed all over the textile and lit. As they burned, the red wax melted onto the textile like blood. Powerful. I only share this as it showcases how passionate Zuhal is about issues that touch her heart. They include animal rights, human rights and ecology. For S/S 16, her Green Embassy collection was created to bring attention to the devastation of the rainforests. They are disappearing at an alarming rate and the loss of that ecosystem is still unknown. The title chosen for this collection - Silent Rainforest. This was Zuhal's third season bringing her GOT certified Eco collection to the runway at VFW and I knew it would be amazing. Silent Rainforest pays homage to Bali and the Amazon, highlighting the devastation of clear-cutting and celebrating all that is unique in these forests. The main fabric used is called Vegan Silk. It is processed from cocoons found in this type of environment without killing the pupae inside. Next she was inspired by the unique orchids found here and began to experiment with different plants and spices to create their soft yellows, pinks and purples. She chopped up red carrots and beets, then sprinkled these vegetables on the silk along with berries and spices like turmeric - creating a look reminiscent of orchids as she went. 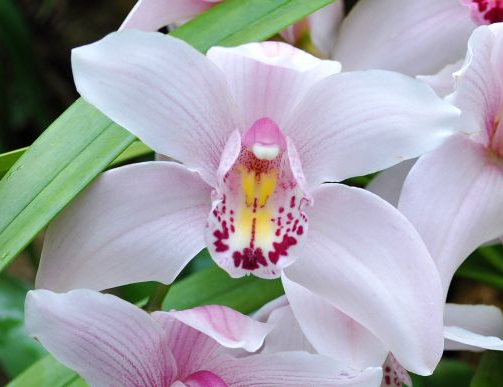 Her background as an artist is clearly evident in how the feel of orchids was captured in the final looks. The fabrics were then rolled very tightly into cylinders and tied. Next these bundles were placed in a basket and steamed for about 15 minutes over boiling water. Then they were allowed to sit and air dry for 2-3 days. After waiting that long, untying the fabrics had to be like opening a Christmas present. As Zuhal unrolled each, the plant materials inside where shaken out onto the ground for the chickens to enjoy. Nothing is wasted. All looks were lined with GOTS Certified organic cotton. S/S 16 offered an enchanting, romantic collection of ethereal looks. The main focus was on evening dresses and there were both fitted and flowing looks. Opening the show was a model wearing a very special dress who literally danced on the runway, She represented the silk moth taking her final, exultant flight - the lower edges of her dress burnt in representation of the rainforests being devastated around her. It was both beautiful and sad. This season also saw the addition of two menswear items in the same fabric - a classic shirt and a tie. I personally think this is the designer's strongest collection to date. Artist, designer, educator and environmentalist - it all comes together in this collection that truly reflects the beauty of the rainforest. I can only say BRAVO!